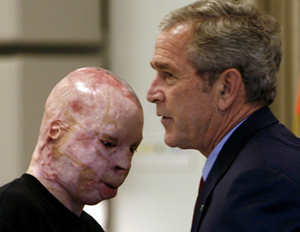 Bush visits wounded troops on a fundraising trip to Texas. Back in Washington, the Democrats wobble. Between campaign fundraisers for the Texas Republican Party and Republican Sen. John Cornyn, George W. Bush visited injured U.S. soldiers at the privately funded Center for the Intrepid at Brooke Army Medical Center in Texas Thursday. <pBetween campaign fundraisers for the Texas Republican Party and Republican Sen. John Cornyn, George W. Bush visited injured U.S. soldiers at the privately funded Center for the Intrepid at Brooke Army Medical Center in Texas Thursday. As the Los Angeles Times reports, "When the president splits his travel time between official events -- in this case, the tour of the rehabilitation center -- and political events, the government picks up a share of the costs that would otherwise be charged to the beneficiaries of the fundraising." Meanwhile, back in Washington, the Associated Press reports that House Speaker Nancy Pelosi has put off a measure that would tie additional funding for the war to a timetable for ending it. Pelosi had hoped to have a vote on the measure as early as today but decided to wait after members of the Democratic caucus told her they weren't sure they would support it. Above: The president meets with Lance Cpl. Isaac Gallegos, who was injured in Iraq in 2006. Photograph by Reuters/Jim Young.